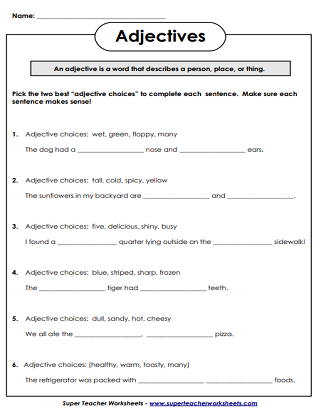 Feel free to use these printable worksheets to help your students learn more about adjectives. Click on the common core icon below specified worksheets to see connections to the Common Core Standards Initiative. Circle the adjective in each sentence. Then, tell what noun it describes. Circle the adjectives and identify the noun each describes. Circle the adjective in each sentence. Underline the noun it describes. Circle the adjective in each sentence and draw an arrow to the noun it describes. This is a 2-sided worksheet. Adjectives usually come before a noun, but not always. Finding these adjectives can be tricky! Choose the best adjectives to complete the sentences. Find each adjective, then write its antonym. Add adjectives for each letter of the alphabet to describe Kiki's kitty. Add an adjective to each sentence to make it more interesting. This activity has kids defining the word adjective. They'll also look for adjectives in a sentence. They'll also write a sentence with two adjectives in it, and correct an improperly-written sentence. Can you find all the adjectives in this silly poem? This adjective activity includes comprehension questions. 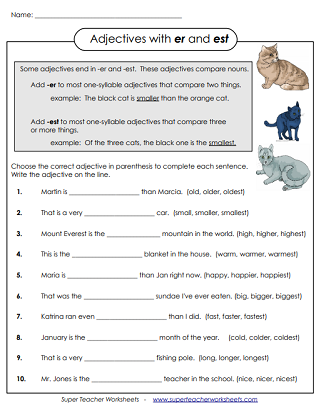 An answer key is also included with this printable English language arts worksheet. Complete each sentence with the word a or the word an. Determine whether the article was used correctly in each sentence. If the sentence is incorrect, re-write it using the correct article. Circle the best article for each sentence. This worksheet features sentences with a zoo theme. Add the word a or an before each noun. 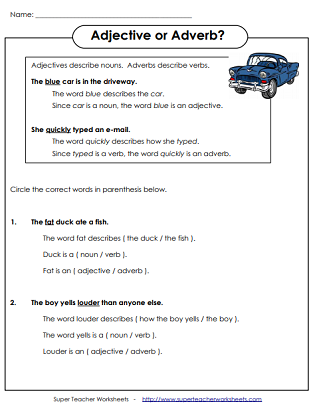 This worksheet covers the advanced usage of the words a and an. Complete the sentences with the correct word. Includes exceptions, such as: an hour, a uniform, a unicorn, and an x-ray. Use the clues to determine whether the underlined word is an adjective or adverb. This is a 2-sided worksheet. Learning about comparative and superlative adjectives. Add -er or -est to each adjective to show comparison. More practice with comparative and superlative adjectives. Add the words more or most to the adjectives to show comparison. To complete each sentence, add -er, -est, more, or most to the adjective in parenthesis. Complete the comparative and superlative adjectives table. Learn the differences between the words fewer and less. Several worksheets to teach simple subject, simple predicate, complete subjects, and complete predicates.